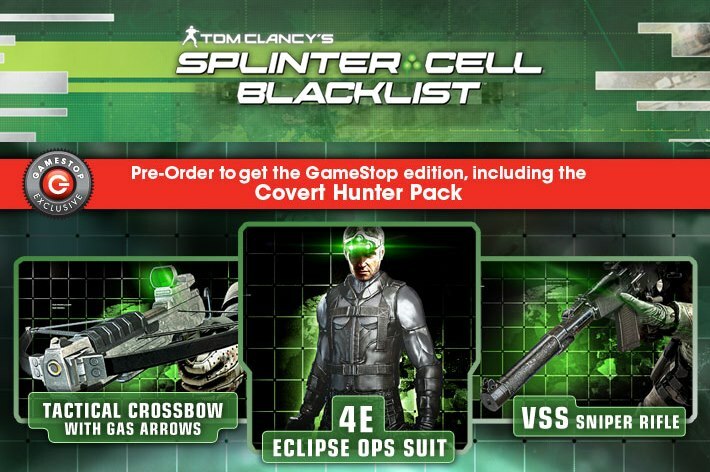 If you are a huge Splinter Cell Blacklist fan, Gamestop has announced that it will be offering some exclusive items if you pre-order from them. The Covert Hunter Pack includes three bonus DLC items. This includes a “Tactical Crossbow with Gas Arrows”, “4E Eclipse Ops Suit” and a “VSS Sniper Rifle”. The pre-order bonus is available for the PS3, Xbox 360, Wii U and PC versions of Splinter Cell Blacklist. It is included with any version of the game you pre-order from Gamestop. If you want to order it noww, visit Gamestop by clicking here.